This Page is a timeline from September 2013, of events surrounding the diverse campaign to stop the Line 9 project - focusing on events and actions after the rubber stamp approval of the proposal by the industry aligned National Energy Board (NEB). The Supreme Court of Canada has granted the Chippewas of the Thames leave to appeal a decision of the Federal Court of Appeal relating to an Application before the National Energy Board to repurpose the Line 9 Pipeline. The court will begin hearing the case November 30th 2016. Enbridge's New Hamilton Office Is Filled With Clowns! In the last several years individuals from across so-called southern Ontario have been resisting the tarsands and local pipeline projects. A diversity of tactics has been employed, and those involved have faced harassment, brutality and arrests for their actions. Recognising the similarities between the legal arguments, The Chippewas of the Thames First Nation and The Clyde River Inuit will be collaborating in their respective challenges to the NEB's understanding of consultation and consent. The Clyde River Inuit have challenged the NEB's decision to allow seismic blast testing in cotal waters. Early morning tampering with Line 9 and Line 7 valves near Hamilton. "People's Injunction" demonstration in Waterloo which demanded new rules for the NEB which consider Indigenous rights and climate change in their decisions. "sometime in the night of january 3rd, 2016 individuals stole into the dark near so-called cambridge and used a manual pipeline valve to restrict the flow of enbridge's line 7. we then applied our own locking devices to delay response time. line 7 is another recently-expanded tarsands pipeline operated by enbridge, running parallel to line 9 & flowing 180,000 bpd of tarsands crude." At 7:30 this morning, individuals used the manual hand wheel at a valve site to shut off the flow of oil through line 9 as an act of protest. They have locked themselves on site to prevent the operation of the pipeline. Three brave friends, Vanessa Gray from Anishinaabek Nation and two allies, shut down ‪#‎Line9‬. Without the consent of Indigenous peoples, Enbridge’s line 9 pumps deadly bitumen through Anishinaabek, Haudenosaunee, Lenape, and Métis territories between Aamijiwnaang and Kahnawake. Serious criminal charges have been laid against all three. Quebec activists manually closed a valve on the line 9 pipeline, forcing Enbridge to shutdown the line for the day. "On December 7, we shut it down. Literally. Most media reported that Enbridge shut down Line 9 as a “precautionary measure”, but we know better. We closed the valve manually. This is historic: to our knowledge, this is the first time that activists have manually shut down a pipeline. Who would have thought that it be so simple?" Waterloo resident Rachel Thevenard begins her @RunAgainstLine9, departing from Sarnia and running the 700km length of the pipeline to its terminal Montreal. Protesters marched through the streets of Montreal Saturday afternoon to denounce the Energy East and Enbridge Line 9 pipelines. Activists disrupted a work site outside of Port Hope, Ontario, yesterday where Enbridge is testing its Line 9 pipeline. Enbridge reps need to demonstrate that the 40-year-old pipeline is safe to carry 300,000 barrels a day of diluted tar sands bitumen between Sarnia and Montreal. Demonstrators sprawled on the floor of Finch subway station amid rush-hour foot-traffic, in a 'die-in', Monday morning to protest line 9 which runs right through the TTC hotspot. The federal court of appeal hears the case brought against line 9 by the Chippewas of the Thames First Nation. While the courtroom was packed with supporters, several hundred people rallied outside the courthouse to express their support for the Chippewas of the Thames First Nation in their battle against the federal government, the NEB, and enbridge. A very long No Line 9! banner hangs for 5 hours in a Montreal rail compound as activists occupy the top of the structure, delaying operations at the facility. Over 40 groups sign an open Letter in Support of Chippewas of the Thames First Nation’s court challenge of Line 9 Pipeline and in support of First Nation's Right to Free, Prior, and Informed Consent. Stan Beardy, the Ontario Regional Chief, calls on the NEB to stop line 9 until the legal challenges are settled. The National Energy Board dismisses the Stay Application filed by the Chippewas of the Thames First Nation. Keeping the pressure on, activists lock down at Montreal oil refinery to protest Enbridge's Line 9, Alberta tar sands. Small Victory as NEB rejects enbridge Leave-to-Open request based on not meeting the standards under various approval conditions. Enbridge scrambles to actually complete the work they were told to do after the NEB also rejects the pipeline company’s request to cancel over 100 “integrity” digs. Waterloo Region Against Line 9 returns to Waterloo Regional Council, to update them on Line 9 and to request that council enact a ban on shipping diluted bitumen through the region by pipeline or rail. Toronto city council passes motion to send letter to enbridge asking the company not to ship tar sands crude through the Line 9 pipeline. Despite NEB approval of Line 9, opposition continues. 6 Day #damline9 Blockade near Innerkip Ontario. The site of a proposed valve installation has been occupied since 7am tuesday august 6th. Blockaders are maintaining their commitment to defend the watershed of the Antler (Thames) river and all waterways and ecosystems that Line 9 crosses and that suffer from tar sands extraction. Line 9 is slated to carry tar sands bitumen and fracked bakken shale oil eastward from sarnia to montreal. The risks of these oils poses a grave threat to ecosystems and communities along the line's entire route. Integrity Dig in Haudenosaunee Territory (North Dumfries) Shut Down! Individuals from Six Nations and their allies interrupted work Thursday and Friday on a section of Enbridge’s Line 9 pipeline. The work stoppage began around 10am Thursday morning. Individuals involved asked workers to leave, asserting that the land is Haudenosaunee territory guaranteed under the Haldimand deed, and that Enbridge’s workers were present without consent or consultation. On Monday, July 14, members of Rising Tide Toronto blocked another Enbridge “integrity dig” site, successfully preventing the company from conducting work on the site that would bring them one step closer to reversing, and increasing, the flow of oil through the aged Line 9 pipeline. "We know that Enbridge has no integrity, and that Line 9 reversal is an unjust and dangerous project," they stated, vowing further direct action in the face of the company’s ongoing development of this pipeline. On Tuesday, the Chippewas of the Thames First Nation in Ontario announced that it had won a motion to appeal the National Energy Board Decision of the controversial line 9 pipeline reversal project. The Line 9 pipeline reversal project was approved by the NEB in March 2014 despite overwhelming evidence presented by opponents to the project showing a 90% likelihood of failure of the pipeline and the complete lack of consultation with or consent from impacted Indigenous peoples along the pipeline route. The press release says that there was no consultation with the Chippewas despite the pipeline crossing the Thames river in the heart of their territory which provides a source of drinking water to the First Nation. Chippewas of the Thames Chief, Joe Miskokomon, feels that the time is right to begin a wider dialogue on a principled approach to natural resources and safer energy projects involving First Nations. Chief Miskokomon is of the view that, “We know that there is a lot of public debate about oil pipelines because we are beginning to see that the old ways of doing business are no longer acceptable because of issues like global climate change and species extinction. Our elders have taught us that when we don’t respect Mother Earth our actions will come back to us”. In the coming weeks, Chippewas of the Thames will be launching a campaign to to support its appeal which calls on various industries and governments to seek a new way of doing business that draws upon First Nations values and honours the original treaty relationship. “We need the public and First Nations across this country to see this appeal as an opportunity to lend their support to Chippewa, and to strongly encourage government and industry to pursue alternative approaches to address how natural resources are developed to benefit the seventh generation”, concludes Chief Miskokomon. With this recent action, the campaign against the Line 9 tarsands and fracked oil pipeline continues. You can read more about this story and First Nations’ rejection of Line 9 at the Two Row Times and the Toronto Star. On Saturday May 10th, Youth from the Aamjiwnaang first nation led a “toxic tour” of the lands surrounding their reserve just outside of Sarnia. About 40 participants took part in the walk which is used as a way to educate settlers and other indigenous people about the impacts the petroleum industry has had on the tiny reserve, which is surrounded by 63 chemical-processing complexes. One stop of the tour was at the community burial site which itself is surrounded by the sprawling Suncor facility on one side, a benzene clean-up area on another, and a 300 foot flare stack in the back. The Tour ended in with a friendship meal in the Aamjiwnaang community centre. Ex-Environment Minister Twitter account deleted after shameful debate on Line 9 (play-by-play in photos). "I was taught not to touch the water." Vanessa Gray, from Aamjiwnaang First Nation, is first in series of Front line Communities interviews. Canadian Unitaritan Council asks for an Environmental Assessment of Line 9. NEB decision allows Enbridge to undertake their project despite environmental concerns, economic risks, and absence of consultation or consent. 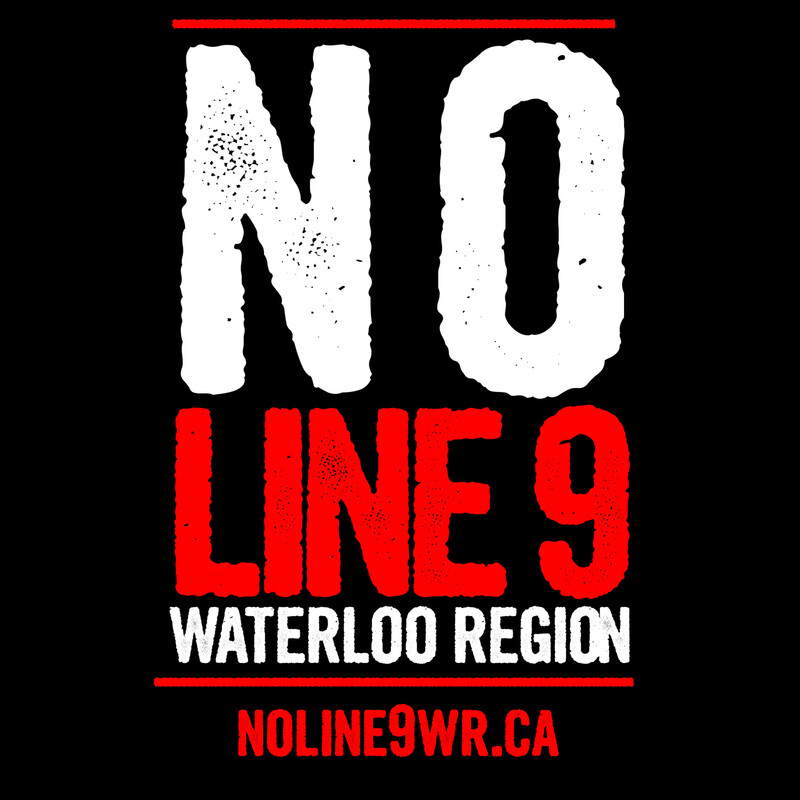 Waterloo Region Against Line 9 Follows Up by delivering Line 9: Not Worth the Risk! Report Launch. Feb 21 2014: A summary of Evidence that was presented at the NEB hearings was assembled and released under the title “Line 9: Not Worth The Risk”. - Statements from CKMS, Poverty Makes Us Sick, Grand River Indigenous Solidarity, and Report Author Sakura. CTV released an investigative report noting among other things, Line 9 has had 35 significant spills in Under 40 Years. Up to this point, Enbridge was claiming line 9 had only spilled 12 times. Street March Against Line 9 in Toronto. Hearings to determine whether or not Enbridge will win approval of its plan to reverse Its Line 9 between Sarnia and Montreal, increase capacity to 300,000 barrels of crude oil per day - up from 240,000 barrels - and the right to use the pipeline to move a heavier form of crude from the Alberta Tar Sands. Audio of the Grand River Indigenous Solidairty intervention presentation to the National Energy Board can be found here with the text of the speech here. The GRIS evidence file can be found at this link. NEB Hearings start in Toronto today, here's what they won't be hearing. Protest Outside NEB Hearing in Montreal Against Line 9 and All Tar Sands Pipelines. In the Lead up to the NEB hearings, the Waterloo Region Against Line 9 Coalition presented to the council of the Region of Waterloo and the board of the Grand River Conservation Authority, 2 actors claiming jurisdiction in the Haldimand Tract. Here is audio and text from the Waterloo Region Coalition Against Line 9 presentation to the GRCA visit. Here is the audio and text of the speech presented to Waterloo Regional Council by the Waterloo Region Coalition Against Line 9. After Enbridge refused a request by the Mississaugas of New Credit to have an archaeological monitor present at Enbridge's Line 9 Integrity Digs, the First Nation has hired a lawyer to ensure their rights are upheld.